Teaching PE to students with autism can be a challenge. In her book, Physical Education for Students with Autism Spectrum Disorders, Michelle Grenier describes the common characteristics of autism and provides games and activities to help overcome the challenges. In England alone, there are an estimated 120,000 school-aged children on the autism spectrum. With 73% of them in mainstream schools and given the growing incidence of children being diagnosed with autism, chances are that many physical education (PE) teachers will have children with autism in their classes. To meet their needs it’s important that teachers are aware of the characteristics of autism. Autism affects the way students understand the world around them. This can make communication and social interaction a challenge. Some also have difficulty negotiating relationships and the distinction between facial gestures and bodily movements. However, it would be a mistake for teachers to assume that students with autism don’t want to engage in social relationships simply because they lack the ability to communicate effectively. In addition, movement patterns can also make it difficult for students with autism to acquire psychomotor skills. They may engage in repetitive behaviours such as rocking or flapping that can make learning a challenge. Often these behaviours are accompanied by internal mental thoughts or ruminations that can make it difficult for children to realise their individual strengths. Attention is another area that can challenge teachers in their efforts to engage students with autism. Common behaviours include difficulties transitioning to new activities, lack of attention for tasks that do interest the student and over-attention for preferred activities. 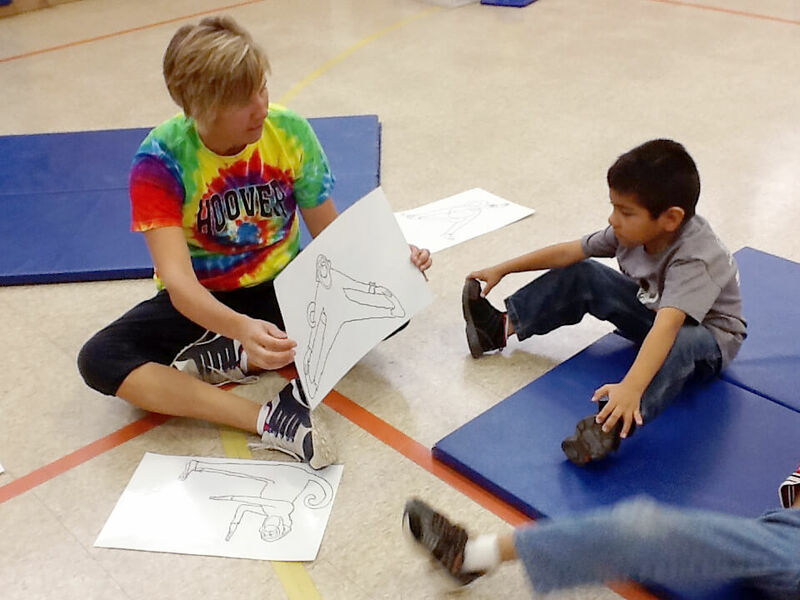 Teachers can help students attend to specific tasks in PE through a variety of methods. These include printing figures and symbols on a card or using iPad applications. Finally, sensory differences or an oversensitivity to smell, touch, sound or movement can trigger unwanted behaviours including rocking or spinning. For example, many children with autism don’t the like bright, fluorescent lights in sports halls/gymnasiums. Teachers should try and prepare ahead and use consistent classroom routines to help lessen students’ anxiety that can affect their behaviour. Physical education teachers may find that they have many tools in their professional toolkits that can be directly applied to teaching PE to students with autism. The following activity suggestion is intended to help teachers begin to apply the skills they already have to help with teaching PE to students with autism. This activity involves students imitating poses that are shown on task cards, individually or with a partner. Monkey See, Monkey Do is a warm-up activity that gives students the opportunity to stretch and balance while working alone or with a partner. Equipment and Materials needed One small activity mat per student and one set of Monkey See, Monkey Do posters. Glue the directions to the back of the card. The directions should include three symbols: a bow or tie to indicate on which part of the body to place the sweatband. A body indicating the position (standing, sitting or laying down). And, a head indicating verbal directions that you might give from the front of the class. An example can be seen in the image below. Exercise mats should be scattered throughout the sports hall, one student per mat. Place three or four cards on each exercise mat. Show the students the pose and say “Do this”, whilst modelling or assisting as necessary. Monkey See, Monkey Do: a fun warm-up activity for children with autism. Begin by having students simply imitate the poses. Also, don’t have them both assume the pose and place the tie/bow on the appropriate part of the body during the initial stages of gameplay. Individual poses are easier than poses involving a classmate. Move from simple to complex. Initially, an adult may need to be the partner. Because students with autism are three-dimensional thinkers, they may demonstrate poses in unexpected places. For example, the directions may indicate “standing” but the student may lie flat on their back. Ties on the limbs of the monkey images can be used for practising left and right. Sweatbands work well as ties because they can easily be slid on and off the arms and legs. Students are able to move the sweatbands from right arm to left ankle as indicated by the image. There are more lesson plans for teaching PE to students with autism available at humankinetics.com.